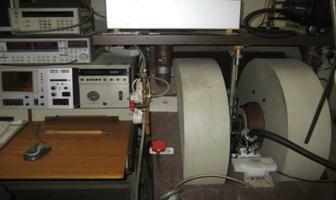 THE EPR spectrometer is for investigations into atomic and subatomic structures. There is an international effort in electron paramagnetic resonance (EPR) dosimetry for measuring ionizing radiation. Paramagnetic centers (molecules or atoms with unpaired electrons) are produced by the action of radiation on materials. In the EPR measurement, irradiated materials are placed in a magnetic field and electron spin transitions are induced by an electromagnetic field of the appropriate frequency (typically in the GHz range). EPR is used as a non-destructive probe of the structure and concentration of paramagnetic centers. The centers created by ionizing radiation are proportional to the absorbed dose and provide a sensitive and versatile measurement method. The EPR is supported by three state-of-the-art X-band EPR spectrometers capable of measuring radiation effects on a wide range of materials from inorganic semiconductors to biological tissues. The data acquisition system provides full computer control of all spectrometer functions, including real-time spectral display and rapid acquisition scan to analyze rapidly decaying signals. The data acquisition system is interfaced with an advanced data analysis station for data manipulation and is capable of simulating and deconvoluting multi-component spectra.